Yves here. It is remarkable that European economists can declare the Eurozone to be resilient in light of the slow motion train wreck in the Italian banking system, the fragile condition of Deutsche Bank and Commerzbank and the ludicrously poorly designed banking regime that came into effect in January 2016. Some economists are approaching a consensus that the Eurozone’s financial architecture is now resilient enough to withstand another shock similar to that of 2010-11. This column argues that such a view may be overly optimistic. Economic and financial instability persists in member states and the banking sector, and institutions to tackle a shock remain incomplete. While the Eurozone remains vulnerable to a bad shock, the blanket application of burden sharing without consideration of current economic and financial conditions is unwise. On 25 June, Vox published a column – “Making the Eurozone more resilient: What is needed now and what can wait”, signed by an impressive list of ‘Resiliency Authors’ – arguing that the Eurozone now has an adequate financial architecture for coping with another ‘bad shock’, and that what needs to be done “mostly [is] to make sure that the rules in place can be enforced” (Resiliency Authors 2016).1 I would like to explain why I feel that this view may prove optimistic and, more importantly, that the careless implementation of existing rules may become the very source of a new bad shock. Is the Glass Half-Full or is it Half Empty? The Resiliency Authors share the view that the Eurozone has not resolved the problem of risk sharing that lay at the root of the sovereign debt crisis of 2010-12. They recognise that the ESM is too small to provide sufficient resources in case of a shock hitting the sovereign debt of a large country such as Italy, while its decision-making procedures would not ensure the prompt action needed to stop a financial market rout. They also see that the Single Resolution Fund may prove too small to meet a major shock hitting a large cross-border bank or an important segment of a national banking system, but hold that in case of need the ESM would be allowed to step in. And they see the lack of cross-border deposit insurance (EDIS) as something to be fixed over time, but not urgent. In sum, the glass in their view is half-full, and they maintain that what we have is sufficient to rule out a new bad shock. I rather see the glass as half-empty. I fear that the combination of extensive economic and financial fragility in some member states and large segments of the banking system on one hand, and an incomplete institutional set up on the other, create sufficient opportunities and incentives for financial investors to test the system’s resiliency – they may only waiting for some trigger to coordinate expectations, and then launch the attack (and the after-shocks of Brexit could well provide that trigger). Should that happen, a new bad shock could well arrive, similar to that of 2010-11. I see three main reasons why the Eurozone remains exposed to a new shock bad enough to endanger its survival. First of all, the re-emergence of severe stress in the Eurozone financial markets is likely to lead to the same acrimonious and publicly voiced disagreements on the source of the shock and its remedies as when the Greek public sector woes first came to full light in 2010. In this regard, failure to agree on working risk-sharing arrangements for sovereign and banking risks reflects fundamentally different, and indeed incompatible, views on the way to bring about lasting financial stability to the Eurozone. The latest manifestation of this is the recent decision by the ECOFIN Council to freeze ‘political’ negotiations on EDIS until “sufficient progress has been made on measures for risk reduction” and, furthermore, that any such negotiation will resume in the framework of an inter-governmental agreement, requiring unanimity, and no longer under the normal Community decision making under Article 114 (the legal basis for the internal market legislation). I view this decision as an official declaration that the sovereign-bank doom loop may restart at any time. It is also unclear that the task of meeting a new bad shock could be left solely to the ECB, as has happened so far. For one thing, a repeat of the 2014 OMT hocus-pocus to stabilise the sovereign debt market of a member state under attack without real interventions would probably not work. However, real market interventions could only be initiated after the country concerned had signed up to an economic programme with the ESM entailing “strict and effective conditionality” – i.e. another intergovernmental negotiation,2 possibly highly divisive, possibly too slow to allow the required swift action by the ECB. Similarly, a lot of the goodwill of the ECB with German policymakers has been consummated to justify quantitative easing, perhaps entailing a reduced ability for the ECB to make ‘unlimited’ resources available for the stabilisation of financial markets in the periphery. Investors would of course recognise the predicaments of the central bank. An ominous sign, in this regard, has been that peripheral sovereigns’ risk premia over the Bund have returned to levels that had not been seen since the start of quantitative easing, following the Brexit referendum. Finally, the reason why a bad shock cannot be ruled out is that the Eurozone is still plagued by severe imbalances in its banking and financial system. According to the IMF’s latest Global Financial Stability Report, one in three banks in the Eurozone must confront severe challenges due to legacy issues (900 billion of non-performing loans and an unspecified amount of toxic assets), and the need to revise business models to respond to a sharply modified economic environment, and adapt to taxing regulatory changes. Let me note in passing that the Italian banking system only makes up for about a third of the bad loans, and is virtually clean of other toxic assets. As bank stocks often trade at heavy discounts from book value, raising fresh capital in the market can be prohibitively expensive, raising the cost of capital well above the banks’ ability to remunerate it. This aggregate fragility has come to the fore after the British referendum, with bank stocks sinking to new lows throughout European markets (Figure 1). The new rules on state aid and the BRR directive3 require that shareholders and creditors share the cost of any public intervention to shore up bank capital, but they provide the leeway necessary to suspend burden sharing when financial stability may be put at risk.4 This risk is stronger when extensive weaknesses plague the banking system. In such circumstances, expectations of the use of burden-sharing and of the bail-in tool by competition and resolution authorities directly affect the risk of capital instruments in the banking sector and, if not properly governed, may actually become a source of instability rather than firming up the system. 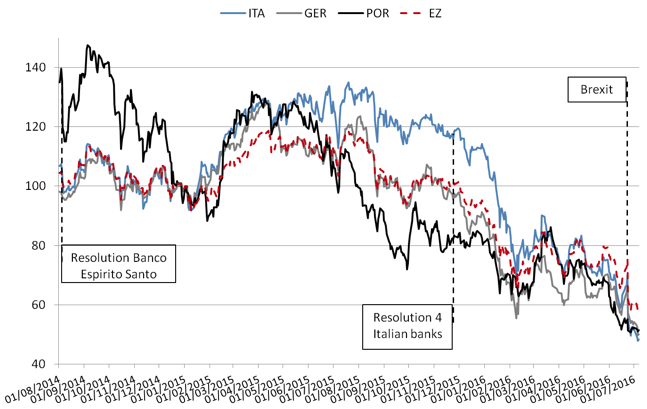 Figure 1 presents data on the evolution of banking stocks in Germany, Italy, Portugal, as well as the Eurozone average.5 As may be seen, with the exception of Portugal, quantitative easing had a galvanising effect on banking stocks throughout 2015. In Portugal, over the course of 2014 the authorities decided – in the context of the resolution of the Portuguese Banco Espirito Santo – to apply burden sharing to certain unsecured bonds held by institutional investors. The decision led to the collapse of Portuguese banking stocks – the senior unsecured bond market seized up not only for Portuguese borrowers, but also for all but the largest banks throughout the Eurozone. Similarly, the figure shows that especially depressed stock prices for Italian banks have emerged following the resolution of four local banks in November 2015. It may also be noted that in the charted period the stock index of German banks behaved no better than the Italian index – an alarm bell confirming that bank weakness maybe a systemic feature of the Eurozone banking system, as is well reflected in the concomitant fall of the overall Eurozone bank index. Note: Index Eurozone (EZ) = Euro stoxx Banks; Index Italy (ITA) = FTSE Italia All Share Banks; Index Portugal (POR) = PSI Financials Gross Return; Index Germany (GER) = DAX Banks. Source: www.investing.com. Two conclusions are worth retaining. First, it would seem to me utterly imprudent to maintain that the Eurozone is no longer exposed to a bad shock, given the lack of adequate risk sharing arrangements. Second, existing rules in EU law do not require the application of burden sharing when this risks financial instability. And indeed, the current financial conditions in the Eurozone seem to require great caution in the application of burden sharing. The idea that the Eurozone would be made more stable by ruthless application of burden sharing without due consideration to the current economic and financial conditions of the banking system seems to me ill-thought and indeed quite dangerous. The case in point in their view is Italy, on the twin counts that large amounts of non-performing loans are carried in the banks’ books at prices substantially above market prices and that the government “has proven very reluctant” to apply the bail-in rules. This can take the form of a full macroeconomic adjustment programme or, under certain conditions, of a ‘precautionary’ programme. The possibility of a precautionary programme may offer a way out, but requires the government’s willingness to sign up to a memorandum of understanding on adjustment measures with the ESM well before the country has its back against the wall – something only far-sighted politicians may be willing to do. Commission Guidelines on state aid to banks of July 2013 and Directive 2014/59 of 15 May 2014. In its 2013 Communication on the application of Article 107(3)(b) of the TFEU in the banking sector (the Banking Communication), the European Commission stated that, whenever there is a capital shortfall, it will require that any state aid be preceded by all possible measures to minimise the cost of remedying that shortfall, including capital raising by the bank, burden-sharing by shareholders and subordinated creditors, and measures aimed at avoiding the outflow of funds from the bank. However, the Banking Communication provides for an ‘exception rule’ whereby burden-sharing can be derogated, when implementing such measures would endanger financial stability or lead to disproportionate results (point 45). The Bank Recovery and Resolution Directive (BRRD), like the 2013 Communication, aims to prevent moral hazard by making the bailout of banks virtually impossible and providing that any extraordinary public financial support will normally entail at least some bail-in of shareholders and creditors, in accordance with the order of their priority claims under normal insolvency proceedings. However, under its Article 32 (4), temporary “precautionary” recapitalisations fulfilling certain conditions – that is, when the institution concerned is solvent, and the injection of funds or purchase of capital instruments takes place “at prices and on terms that do not confer an advantage upon the institution” – are permitted without activating the bail-in instrument when they are adopted to remedy a serious disturbance to the economy of a member state and to preserve financial stability. The indices have been calculated with basis 2 January 2015 = 100 to highlight the initial impact of quantitative easing by the ECB. This entry was posted in Banana republic, Banking industry, Currencies, Doomsday scenarios, Europe, Guest Post, Regulations and regulators, The dismal science on August 21, 2016 by Yves Smith. Another post about the importance of rescuing banks & rescuing all investors in banks? I’m surprised that the Brexit vote isn’t mentioned in this post. I would suspect that the economic knock on effects already being incurred could trigger the shock scenario that would sent Europe into a tailspin. Opel has announced cutbacks in manufacture in Germany ahead of the the Brexit. How can loss or damage of a major European market not trigger such an event? Single Resolution Mechanism to come into effect for the Banking Union – Brussels, 31 December 2015) Seems more like an after-shock ‘plan.’ Should it really get this far if control tests are performed properly in the first place? Oh yeah, the results of such ‘tests’ are non-binding. Happy days. I do not understand with the wild amounts of debt that exist today–both on the government, corporate, and personal balance sheets–how any financial shock can really be absorbed. It seems to me that this system is, to a frighteningly large extent, existing on a very fine line over a deepening abyss. Will the next round of rumors about shaky bank balance sheets cause a cascade of depositor flights from multiple banks? After all, with the ecb’s negative deposit rates, there’s already a ‘flight to physical cash’ underway. It may not take much to accelerate it. Then, we could easily see officials stating that ‘bail-in’ rules are ready to be applied, which will cause a new wave of ‘flight to physical cash’ to accelerate. Reading this post in light of the information in Friday’s post by Bezemer and Hudson. When the debt/rents (FIRE and IP) sector of the economy reaches a certain percentage of the whole economy, the economy slows, the real economy suffers, the economy becomes more fragile. The FIRE (Financial, Insurance, Real Estate) sector can keep the debt/credit expansion game going only by finding more places to extend credit. When the the economy becomes over-burdened with debt/credit the financial sector itself become fragile and subject to ‘crash’. That seems to be where the Eurozone is now. Too much debt/credit already created, no more places to extend that credit within the Eurozone. If this were a Ponzi scheme one would say the banks (financial sector) had “run out of new investors”. adding: are the TPP and TTIP attempts to delay the inevitable denouement of neo-liberal finance by creating larger “markets” for credit/debt/rent extraction? Very good points. Thank you. It is always astounding* to me how economists go on and on about credit availability, and yet nary a word EVER about raising incomes to pay the ever increasing debt…. *Well, if the FIRE sector pays for all the “think” tanks and rationales for government bail outs of banks, I guess its not astounding at all….. The star being in an extremely small font, so no one can actually see it. * Providing there are no “black swan” events and there are a lot of “black swans” about these days. “When I use a word,’ Humpty Dumpty said, in rather a scornful tone, ‘it means just what I choose it to mean — neither more nor less. '” We all know what happened to Mr. Dumpty. And he doesn’t even reach the little detail that they are pretending they have a sovereign currency they can use like a sovereign currency when in fact they have a pseudosovereign currency that can’t be so used.